After granddad died in October last year, I said I'd get around to writing something about him. One thing I wanted to include in that post was an older photo of him, but I never got around to looking through our old photo book, so I never got it scanned, so I never got that post written. A couple of days ago my mum rung me up while I wasn't doing anything particularly productive with my annual leave - just playing video games while water fell from the sky and pelted people who ventured outside with liquid bullets. I was sort of dreading it'd be another call from this international telecommunications company asking if I wanted cheaper international calling rates to the Philippines (I received 3 of those calls from that company’s call centre that day), but it was my mum, sounding a bit stuffy, like she would when she'd been sick a couple of days. She wasn't sick though - she had called me to tell me that grandma had died. I've only ever had 1 set of grandparents. Those on my dad's side of the family I either never met or couldn't remember meeting because I was too young, so when I think of my extended family – cousins, aunties, uncles, grandparents – I think of those on my mum's side. My mum was one of 11 children, so barring my auntie and her family that live in NZ, I have some trouble keeping-up with the size and names of my entire family. Every time we'd go to the Philippines to visit grandma and granddad and co, there'd be new cousins to meet, and old cousins with new faces to get used to. After my family moved to New Zealand, we didn't go to the Philippines a lot. I can also remember granddad and grandma coming to New Zealand once. All up, I could count on 1 hand the number of times I had actually spent with my grandparents. It wasn't a helluva lot. So when I got the call from my mum this year about grandma, I didn't have any real reaction: I pretty much went 'oh', talked a bit more on the phone, hung-up, then went back to whatever I was doing. It was like that for a few hours afterwards in that I didn't give the matter much thought. Then, I started to give the news of grandma's death more room in my head. What did I do? I didn't cry, I didn't even feel sick. I just Tweeted the news for the world to read, then I started to wonder why I wasn't feeling as terrible about the whole thing as I thought I should feel, or the way I thought others thought I should feel. To feel grief (keen mental suffering or distress over affliction or loss) or great sorrow. What I felt after both granddad's and grandma's deaths wasn't as strong as the grief described above, or a great sorrow. The last time I saw them was Christmas / New Year's 2007/2008, which was the last time our family went to the Philippines together. In the Philippines, that period is like a week-long holiday - we'd have relatives come to our grandparents' (which is where we were staying) during all times of the day. When it came to Christmas Day and New Year's Eve/Day though, everyone was there. I remember seeing those who came to visit grandma and granddad, and saw what really close ties my extended family had: my cousins loved coming over to see grandma and granddad, and my aunties and uncles really enjoyed talking and eating and laughing with them. 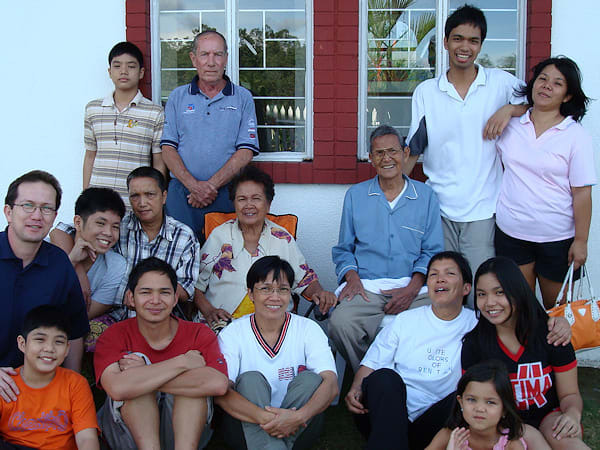 I remember feeling a bit envious of the really tight relationship my Philippines-based extended family had, but mostly I felt very happy to see that what I had with my immediate family and NZ-based extended family was being duplicated there as well. Maybe it's just Filipino families (and other family-centric cultures) that are really close-knit and together - I keep hearing stories from many of my New Zealand friends about family dramas or families just not getting along, which only serve to remind me how good/lucky I and my whole family seem to have it. So when I think of no longer having any grandparents, as well as feeling bad for my mum who has now lost her parents, I feel quite bad for all my cousins, aunties, and uncles, who are now missing those vital pieces of that close family puzzle that I saw all those years ago under a sunny Christmas Day sky. I may not have spent as much time with my grandparents as I could have, but I have some very good memories of them both. For grandma, my favourite memory was when my family went to spend Christmas / New Year's of 1992/1993 with them. It was the first time we had come back to the Philippines as a family since we moved to New Zealand, and during that visit, grandma made hot dogs for breakfast one day, and my brother and I really really liked it. From that day on, grandma would cook us hot dogs for breakfast, every day, for the rest of the days that we were there visiting. It quickly became the part of the day I anticipated the most. For granddad, it wasn't really anything we did together that really stuck out, but something he said, or I was told he said. I was the first of my generation to have graduated from university, and I was told by my mum when she relayed the news to the Philippines that granddad was really happy and proud of what I had done. During our last family visit in Christmas / New Year's 2007/2008, a few years after my graduation, granddad came up to me one time and tried to say as much. Unfortunately by that time something had happened to granddad and apart from being sick and hospitalized every so often, he also became difficult to understand. I only got some words of what he said then, but I think I got the gist of it, because it was the only thing I really felt I understood from him during that entire visit without grandma nearby to translate. I was afraid that I might have become some kind of emotionless robot given my lack of strong reaction from the loss of my grandparents, but maybe I'm feeling just the appropriate amount given my distance: I'm thinking of the rest of my family, particularly in the Philippines, how close they were to grandma and granddad, and feeling how much more it must hurt them over there; I'm thinking of the few times I did have with grandma and granddad, and how I felt with them then; and I'm thinking of how, with both of them gone, what it will mean to my family as a whole - my grandparents were the reason I went 'home' to the Philippines in the first place and are the link in the family tree that connected me to the extended family that I really like being a part of. I'm gonna miss that. I'm gonna miss them. And that makes me sad. Anyway, I still don't have those older photos that I wanted, but I went through the ones from my last visit and managed to find this one of my grandparents, surrounded by a very small fraction of the entire family.